1. 200 million male chicks are killed immediately after hatching. The process is called “chick culling,” but that’s a much too cutesy name for the practice’s brutal reality. Farms now use separate breeds for egg-producing chickens and broiler chickens, so almost every male laying chicken that’s born is killed immediately. The recommended humane method is to asphyxiate with carbon dioxide, but the American Veterinary Medical Association recently added putting non-anesthetized chicks through a grinder as an acceptable way to kill the newly hatched. 2. Chickens are four times bigger today than in 1950. According to a study conducted by researchers at the University of Alberta and published in the Journal of Poultry Science, chicken breast sizes have increased more than 80 percent since 1950, and hens have doubled in weight. Martin Zuidhof, one of the lead scientists, attributes the massive growth to a movement in the late 1940s to create more profitable meat chickens and not just sell them as a byproduct of the egg industry. The researchers were also clear that the increase in size was not because of artificially added hormones but from highly successful selective breeding. 3. 25 percent of America’s chicken goes straight to fast-food chains. Statistics from the National Chicken Council show that 56 percent of all chicken goes to markets for retail, 25 percent goes to fast-food chains, and 19 percent goes to smaller restaurants. In 1970, fast food accounted for only about 14 percent of the market share. Chicken’s increasing popularity, especially among fast-food chains, is likely due to skyrocketing beef prices. Because burgers were no longer bringing in the big bucks—at some point in 2013, McDonald’s was losing money on every McDouble—chains started to push the nuggets. 4. Those ‘free-range’ and ‘cage-free’ labels are meaningless. 5. Three corporations control a majority of America’s chicken. According to The Meat Racket by Christopher Leonard, Tyson Foods, Cargill Meat Solutions, and Perdue Farms are responsible for half the chicken produced in the U.S. Tyson is known for revolutionizing the system of contract farming, in which farmers raise chickens completely under the corporation’s guidelines, sourcing feed from its suppliers and using its veterinary support. Today Tyson has more than 6,000 contract farmers, and other companies have followed the model. The mostfamous contract farmer of late is Craig Watts, who has alerted the press to practices required by Perdue that he alleges are inhumane. 6. Russia buys billions of chicken quarters from the U.S. every year. Russians ate a lot of chicken legs in 2009, when the country imported 1.6 billion pounds of dark meat from stateside producers. Why? 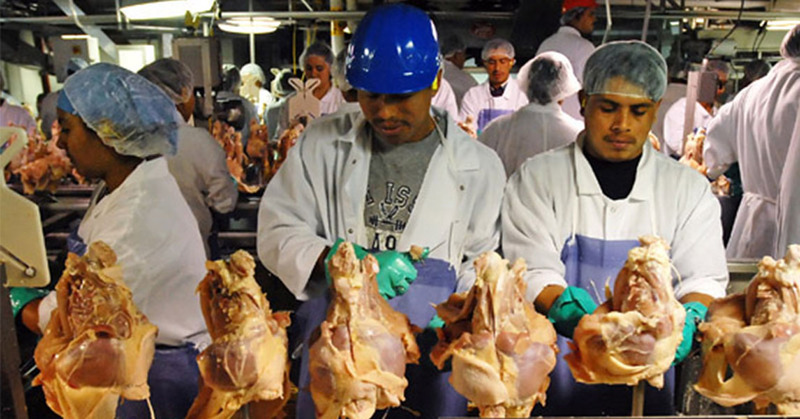 Americans won’t eat it, so a large percentage of dark meat is exported. Chicken breast has always been the most popular cut in the U.S., and with buffalo wing franchises exploding, the drumstick and thigh (pictured) end up being the neglected cut. Breast meat is so popular that when McDonald’s reformulated its Chicken McNuggets to exclude all dark meat, its sales increased 35 percent immediately.